Our lovely Kerrie Glembocki (Sloniewski), age 37, passed away suddenly on February 8, 2019 from a brain aneurysm. We are struggling for answers as to why such a young wonderful person was taken from us so soon. Kerrie was born in 1981 in Wilmington, Delaware to Gene and Debbie Sloniewski. We had no idea at the time, but that day, a true angel was brought into our lives. 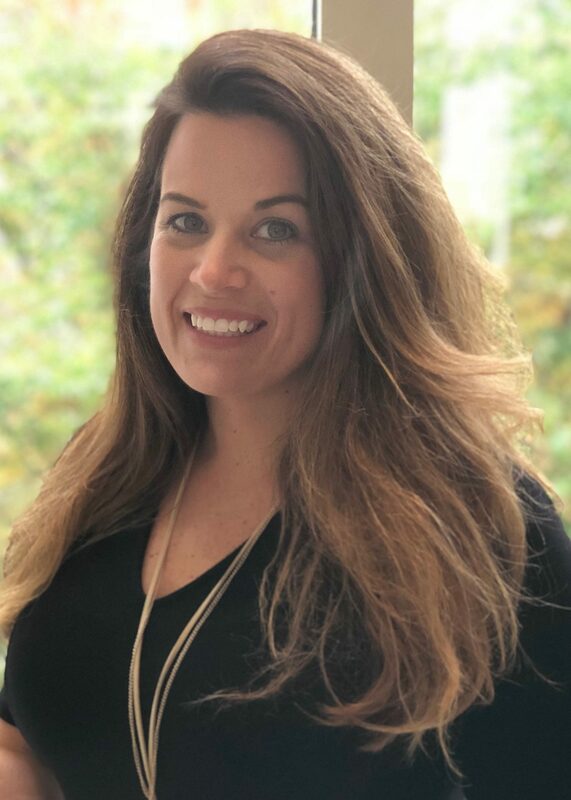 She graduated from University of Delaware in 2004 and built a successful career at MBNA/Bank of America over 17 years, where most recently, she was a Vice President in the Marketing department. She was a devoted wife to her husband, Brian, but the role in life that she relished most was that of Mommy to two adorable little girls, Jocie and Ellie. Kerrie was the absolute best mommy around and always doing fun and creative things with her children, such as setting up a bounce house in their living room for her children and their friends to jump. She always had the best snacks in her house. Kerrie loved sushi and crabs and spending lots of time with family in Bethany Beach and Lewes. One of her favorite activities was exercising at 9round. She was an active volunteer, creating sets for her daughters’ dance recitals at Dance Delaware and participating in the Bank of America volunteer network. She also loved to have fun. She was constantly planning parties and decorating to make every holiday extra special and really looking for any excuse to get together with friends and family. Above all, Kerrie was a true superstar, the kindest, most generous and FUN person we ever knew. She was selfless, lived life to the fullest, and always had a bright smile on her face. We will truly miss her and will never forget her. Kerrie is survived by her beloved husband, Brian; her daughters, Jocelyn (9) and Ellie (8); her parents, Gene and Debbie; her brother, Chris and sister Pam Tucker (Matt); her in-laws, Harry and Sue Glembocki and sisters-in-law, Alison Osborne (Jim) and Sharon Villaverde (Cris); her dog Hondo; and many nieces and nephews. Family, friends and others whose lives she touched are invited to Chandler Funeral Home (2506 Concord Pike, Wilmington, DE) on Saturday, February 16 at 10 am to reminisce, grieve, and share fun stories about Kerrie. The viewing is from 10 to 11:30 and a service will follow from 11:30 until noon. Kerrie you were a bright light in our lives and I will always remember all the family times together over the summer - I am so sad you were taken from us so soon, I will always remember the family picnic and wiffle ball games, Kerrie's deviled eggs, and the August annual pilgrimage to get the large plastic plants you carted down Evans Avenue from the St, Ann's Bazaar to add Debbie's collection. You were the youngest fun cousin and loved life to the fullest and the reason everyone loved you so much!! I will always remember you that way, beautiful and smiling. To Brian & the Girls ( Jocie & Ellie) , Debbie & Gene, Pam & Matt, and Chris broken hearts mend over time but hers will never be replaced. Please take comfort she is following you all from above - hugs and our deepest love to you all! My deepest sympathy for your loss. My thoughts and prayers are with you and your entire family. May your beautiful memories sustain and bring comfort to you during this difficult time. Kerrie was one of the sweetest people I knew. She was always a ray of sunshine. I enjoyed working with her over the past 5+ years and will miss her greatly. God rest her soul. My deepest condolences and prayers go out to her entire family. I had the pleasure of seeing Kerrie every day at work. Kerrie was a breath of fresh air - always so nice, smiling and above all, genuine. She always found the positive side of things. She will be sorely missed. My condolences to her family and friends. We are shocked and saddened by the sudden passing of our friend. I worked with Kerrie in Marketing and she was a lovely person inside and out. She was always smiling and laughing and we shared the love of decorating. Our floor will never be the same without her and she will forever be missed. My deepest condolences to the entire family. I am shocked and deeply saddened by this terrible news. I worked with Kerrie the past 6 years from the other side of the fence -- I am with Harte Hanks, a partner agency of Bank of America. I loved working with Kerrie. She was always upbeat and positive. And though I never met her in person, I knew from her voice that she always had a smile on her face. My heart breaks especially for her family and friends. But please believe me when I say her light and kindness reached far beyond those she saw every day. I will miss you, Kerrie. And I'll remember your cheerful voice and all the little things you did for the Harte Hanks team over the years. God bless you. I had the absolute pleasure of working with Kerrie as a Bank of America vendor partner since 2013. Kerrie was such a kind-hearted spirit, always positive and upbeat. She was the real deal - genuinely lovely in every respect. She would always run up to me with a hug and a hello when I visited the Wilmington office. As a client, she was what every agency appreciated - always prepared, thorough and quick to respond. She will be missed by all who were blessed to know her. I am keeping Kerrie and her family and friends in my thoughts and in my prayers during this difficult time. Kerrie was a beautiful person who showed me so much kindness when we worked together. I was lucky enough to sit right next to her in 2000/2001 at First USA when we were on one of the night shift collections teams. She was never anything but extremely pleasant to me. She even organized a team baby shower for me in the summer of 2000. We were the same age 19-20 at the time. I’ve never forgotten what a wonderful person she was. I’m so sorry for your loss. I was lucky enough to become friends with Kerrie through our time working together at Bank of America. Kerrie’s kindness was unmatched. She was smart, sweet, hard working, giving, and funny. She smiled through any situation, and made the world around her a better place. I am truly sorry for your heartbreaking loss...praying for your entire family. It is such a joy to teach the Glembocki girls at Dance Delaware. Kerrie was the best kind of dance mom ever and we are all reeling at what has happened. I know our studio is ready with open arms to help care for Jocelyn and Ellie. Kerrie will be greatly missed and words fail. But I know she lives on forever in her two amazing girls and will continue to shine in this world. I send my sincerest prayers for God's comfort and care for Brian, Jocelyn, and Ellie, and all the family and friends whose hearts are breaking at this loss. It is hard to find the right words to say how sad and shocked everyone is with this news of your loss. You were so kind and sweet to everyone you met. I will miss seeing you in the office and stopping by your desk for a quick chat. God bless you Kerrie, I pray for your family and friends to find peace in this time of sadness. You will never be forgotten. It is with the heaviest of hearts that I send my sincerest condolences to Kerrie's family. I had the pleasure of getting to know Kerrie as a fellow dance mom. She was honestly just someone who you couldn't help but adore, with the sweetest personality. Our hearts are broken, and I know her legacy will continue in her two beautiful daughters Jocie and Ellie. I had the true blessing and honor being around Kerrie at MBNA/Bank of America the last 17+ years. I'll forever cherish her positive "can-do" attitude, funny stories, smile and laughter that got us all through anything and everything and her creativity beyond belief. I'll never forget our BOAST (Bank of America Spirit Team) days, planning events that were decorated and executed flawlessly all because of Kerrie! I struggle to understand the "why" behind her passing but believe it was time for God to have a "Shabby-Chic" angel in heaven. Kerrie will be greatly missed....my thoughts and prayers are with her family and friends during this very difficult time...May the memories of Kerrie and the love of family and friends surround all of you and give you strength in the days ahead...God Bless. I had the pleasure working with Kerrie at the bank. Our morning routine would be walk to the café, grab a light snack and talk about the “Reality Shows” from the night before. In the afternoon our conversations were about her beautiful daughters. I will miss her contagious smile, her positive outlook on life and all the talks we had about everything. Kerrie always brought joy to everyone she came in contact with and will be dearly be missed. Heaven gained an amazing angel! My deepest condolences to Brian, his sweet girls and all of Kerrie’s family. I will miss Kerrie’s smiling face at 9R. We are so sorry for your loss.Kerrie was amazing dance mom we will miss her smiling face but never forgotten when we see her daughters in dance will bring so many memories. Gene, Debbie and family. I am so sorry to hear about the passing of Kerrie. You and your family are in our thoughts and prayers. My heart goes out to you all. I met Kerrie in October 2005 when I moved from NJ to DE. She was one of my mentors in the department I was in. From that first day until the last time I saw her last October, that contagious smile was always her norm. One of the most positive minded people I've ever encountered. I sit here today confused, hurt, and sad. Such a loving wife, mother, daughter, aunt and friend. My sincere condolences goes out to her husband Brian, their daughters and the entire family. I know one thing is for certain, Heaven became an even better place now that Kerrie is there. You are loved and missed more than you'll ever know. Rest In Peace Kerr Bear. We are so sorry for your loss. Condolences to you, your girls and Kerrie's family. Prayers are with all of you. Gene and Debbie, I am so sorry about the passing of your daughter Kerrie. I will be praying for Kerrie, the Glembocki and Sloniewski families. Condolences to the Glembocki family. Our thoughts and prayers go out to your whole family. Psalms 147:3 says God, "heals the broken hearted, and binds up their wounds." May God bring you comfort and peace. I will always remember Kerrie for the sweet kindness she shared everyday. Every time we got together we had fun - no matter the occasion or the mood. She made all moments feel special. On vacations, she was the baby whisperer for Shawn and Camryn says she’ll miss all the wonderful things Mrs. Kerrie did for her. Our lives are forever changed and a piece of our hearts are now in heaven. I pray everyday for Brian, Jocelyn, Ellie and the rest of her family and friends. I am so terribly sorry for your loss and my heart is broken. Kerrie and I went to high school together for a short time, but we hung out often in those days. It has been a while, but I have great memories of her then. She was a really beautiful person, inside and out. Such a terrible loss. My deepest sympathy to all of her family. I did not know Kerrie personally but have heard such wonderful things about her because my granddaughter is a close friend of Jocie's. My heart goes out to the family at this difficult and sad time. Wishing you peace and ease in the weeks ahead. I was shocked and devastated to hear of Kerrie’s sudden passing. I had the privilege of working with Kerrie for many years and am honored to have been able to call her my friend. She was such a beautiful person both inside and out with a smile and laugh that was infectious. Our lives will never be the same without her and she will forever be missed. My deepest condolences to Brian, her lovely girls and the entire family. Dear Gene & Debbie and family, We feel so sorry for your loss and can't imagine what your poor family is going through at this time. Love Pat & Eddie Lesniczak Our prayers and thoughts are with you and your family. Kerrie was the sweetest little girl and stayed that way. I have the fondest memories of her and Pam playing with my girls. It was such a pleasure to have her be a part of our life in Cleland Heights. I was so shocked and heartbroken when I heard of her sudden passing. My thoughts and prayers are with you all. My condolences to Brian & the girls along with all of Kerrie’s family. Everyone is in my thoughts and prayers. Kerrie was a beautiful person inside and out and always had a smile on her face and laughing even while blowing up balloons 🎈, decorating for one of our events then we would eat pizza afterwards (of course she always picked her favorite place, Dimeos ). All of her Amazon prime orders & Oriental trading too cute. My heart is so sad right now sending my love. I have struggled to find the right words and honestly, there are no words to describe the pain I’m going through right now. I have had the pleasure of working side by side with Kerrie over the past few years and during that time, our friendship has grown into something very special. I’ll always remember our daily conversations during the years, from stories about family, going on vacation, our girls growing up, work issues, but most importantly what she was ordering from Amazon that day. She loved finding new things and got me hooked on StitchFix. We finally introduced our girls since they were the same age, and it warms my heart to know that our girls are now great friends, just like Kerrie and I. She was a beautiful person, inside and out and will always hold a very special place in my heart. I miss you dearly my friend and I will be forever grateful for the friendship that we built. Sending my love and deepest sympathy to Brian, Jocie, Ellie, and the entire family. Our family is truly blessed to have known Kerri. Kerri was one of the nicest and most caring person we have ever met. She always had a smile on her face, always willing to lend a hand and all around an amazing person. Her light and joy around the neighborhood will be missed so much. Brian and the girls, if there is anything you need or we can do, please don’t hesitate to ask. We are all here for you. Prayers to all the family. Dear Debbie, My sincere sympathy to you and all of your family as you grieve this sudden and unexpected loss. May memories and loved ones be a comfort to you. I am holding you all in prayer. We did not know Kerrie but she seem to have been an exceptional woman. Brian, our hearts do out to you and your family. We will keep you in our prayers. I know both Kerrie and Brian through the bank. I am keeping your family in my thoughts and prayers through this time.